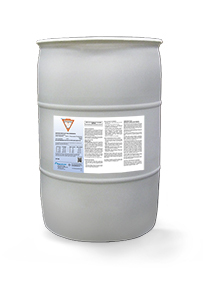 Aquatrols® Fifty90 is an economical alternative for those interested in a longer lasting surfactant. Fifty90 is proven to remain effective in the soil for up to three months, reducing water repellency and localized dry spots. Unlike some “longer-term” surfactants, Fifty90 is effective regardless of turf type, environmental or climatic stress conditions. Consistent 90 day control over soil water repellency and localized dry spots. Does not break down due to stressful weather conditions. No initial decline in turf quality that you see with many other competitive products. Fifty90 performance isn’t just confined to the uppermost layer of the profile. A trial comparing long term surfactants was conducted in Athens, GA. Fifty90 significantly reduced water repellency in the 1-2 cm zone on 7 of 10 dates, while product C was only significantly different 3 out of 10 dates. At the 2-3 cm zone, Fifty90 was significantly better 6 out of 10 dates while product C was only significantly different once. Overall, Fifty90 showed more consistent performance deeper in the profile than Product C .
Research conducted on a native, sandy soil, bentgrass fairway at Southwind Country Club in Garden City, Kansas, further supports Fifty90 as the superior product in managing water repellent soils. Three surfactants (Fifty90, Tournament Ready™, and Cascade™ Plus) were evaluated according to label directions. 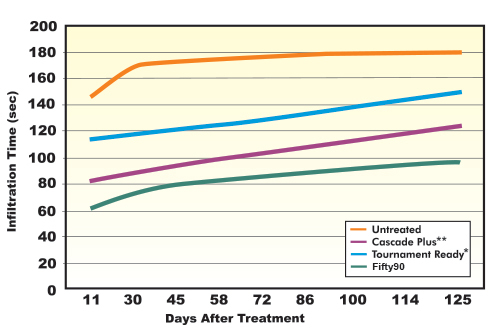 Fifty90 provided the greatest reduction in soil water repellency, with control 50% better than Tournament Ready and 25% better than Cascade Plus. Fifty90 performance was the most consistent throughout the four month test period.